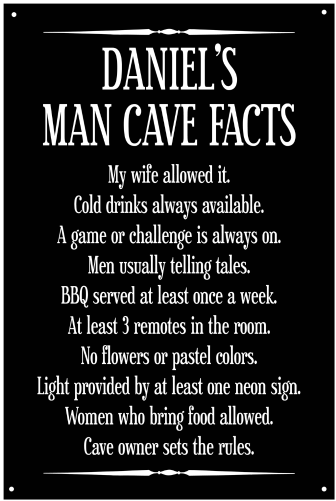 This Personalized Man Cave Facts Metal Sign lists 10 facts that we have discovered to not only be humorous, but quite truthful about many Man Caves in general. This quality man cave sign is durable, has a black background with white writing, has a long lasting finish and is approximately 12 in. x 18 in. It is drilled and riveted for easy hanging. Proudly hand made in the USA, this sign is just under 2lbs and is made of heavy 24-gauge American steel. A Man Cave Gifts Exclusive!